It’s a privilege that physicians we know and work with are involved in life-saving events on a daily basis. Perhaps none more so than Bill Long, the Director of the Level 1 Trauma Center at Emanuel Hospital (Legacy) in Portl and, OR. CLICK HERE to read how Dr. Long created the only American College of Surgeons Committee on Trauma (ACSCOT) Verified Level I Trauma Center in the Pacific Northwest. The following information is not designed to rehash the myriad accounts being covered in the mainstream media, but rather a glimpse into a multi-organizational trauma system that worked flawlessly to save an officer’s life. What follows is a rough time-line of the treatment of the officer followed several questions answered directly by Dr. Long. Policeman gets shot in small coastal town, normally 2 hours away from Portland. 2259 Another policeman on scene, held pressure on patient’s entrance wound. 2315 Ambulance on scene. Jeff Creff, EMT, puts REACH, an EMS helicopter based in Corvallis, on standby; Jeff’s wife, Trish, also an EMT intubates patient after Pat Ganz, EMT starts IV. 2332 Ambulance arrives at level 4 trauma center. Blood pressure barely palpable. 2337 In Hospital ED. No BP, HR 132. 2343 UNCROSSMATCHED blood started (3 units) BP rises to 134. Hospitalist (Bob Oksenholt, cardiologist and pulmonologist) and Mike Egan, MD (attending surgeon with naval medical training) arrive to help out. Decision made to not try to operate patient but transfer. REACH called. TRNs (trauma resuscitation nurses) are responsible for providing all the blood products in a set ratio, drawing labs and ABGs every 15 to 30 minutes to track trends in the patient’s coagulation status, Hematocrit, and blood gases, including acid base balance. They have to replace the amount of blood that was lost, being lost as the blood pressure improves, and will be lost from damage control surgery and postoperative oozing. The coordination of the lab, blood bank, and delivery and infusion of products determines the severity of coagulopathy in a massive transfusion case. The anesthesiologist supports the heart function, sometimes with inotropes and pressors, but mainly through ion controls of potassium and calcium and pH, in addition to managing the anesthetic and ventilation. Replaced blood products : 20 units of PRBCs, 8 units of FFP, 8 platelet packs, 4 units of Cryoprecipitate. Coagulation studies at end of surgery: Hct 20 Plts 132 INR 1.7 Fibrinogen 145 Ionized calcium 1.8 MTP stopped. 0230 To Cat Scanner for torso survey. No unexpected findings. 0300 To Trauma ICU for critical care. Later in day: Fasciotomy for elevated compartment pressures in left leg. 2nd Post-op Day Re-exploration laparotomy, removal of packs, reanastomosis of stapled segments, colostomy, closure of abdomen…very little edema– surprising. Note: For a copy of the time-motion study of this case, send me a note and I will have a copy forwarded to you. 1. If you had to boil down to key elements to saving the officer’s life…the things that had to be executed flawlessly, what were they? Officer is able to call in, and activate system… fellow officer applies pressure to bleeding abdominal wound. 18 min ambulance response time, with EMTs notifying EMS helicopter to be ready to launch. EMTs aware of Level 4 trauma center’s limited capability and blood bank stocks. This notification avoided a 30-minute delay later!!! 35 min. total pre-hospital time from the time of the injury. o Adequate IV access with large bore IVs, early use of UNCROSSMATCHED blood. o < 30 minutes of hospital assessment, resuscitation, and stabilization time —–no unnecessary studies, cat scans, etc. Patient needs an OR!!! o Early launch of REACH helicopter enabling transport of patient as soon as resuscitation phase was over. 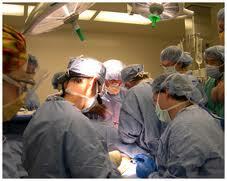 Direct to Operating Room with abdomen being prepped while additional IV lines are inserted. Damage control surgery, with no major vascular repairs in a contaminated abdomen. Rapid coordinated operative care with two attendings and a resident…Antibiotics redosed as we did exchange transfusions. Temperature control to avoid hypothermic coagulopathy. 2. What kind of time-lines were involved from the first response to ER to your team etc? ONE HOUR damage control surgery. We were fortunate that the external iliac artery and deep pelvic veins and arteries weren’t injured and bleeding excessively. 3. Anything other items you can think of that would make this somewhat of a case study on how it should be done for others in the industry. Harvard educated in Physics. Brown University for medical school and surgery training. Training in Burn Surgery at Harborview/University of Washington; fellowship with famous burn surgeon: Charles Baxter, MD. Burns and Trauma attending surgeon at University of South Alabama. Currently a Colonel in US Army Reserves; Seth has been to Iraq/Afghanistan 3 times, and leaving for Afghanistan in a several weeks. Deputy Sheriff with Clackamas County and member of SWAT. Attending trauma surgeon with Emanuel for 10 years. Associate Trauma Medical Director for ATLS & RTDC and Outreach to rural hospitals. I am an entrepreneur active at the intersection of healthcare and technology with a specific focus on physician success. Some of my other interests, and therefore things I write about from time to time, include: social media, oil & gas exploration, flying, wine, cigars, martial arts, golf, mathematics and history.